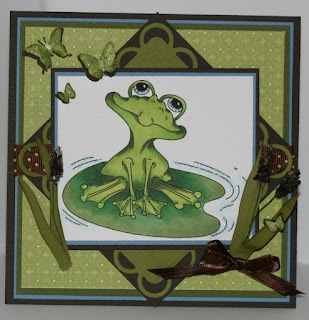 Hello and welcome to Day 3 of our August Digital Stamp Release Showcase! 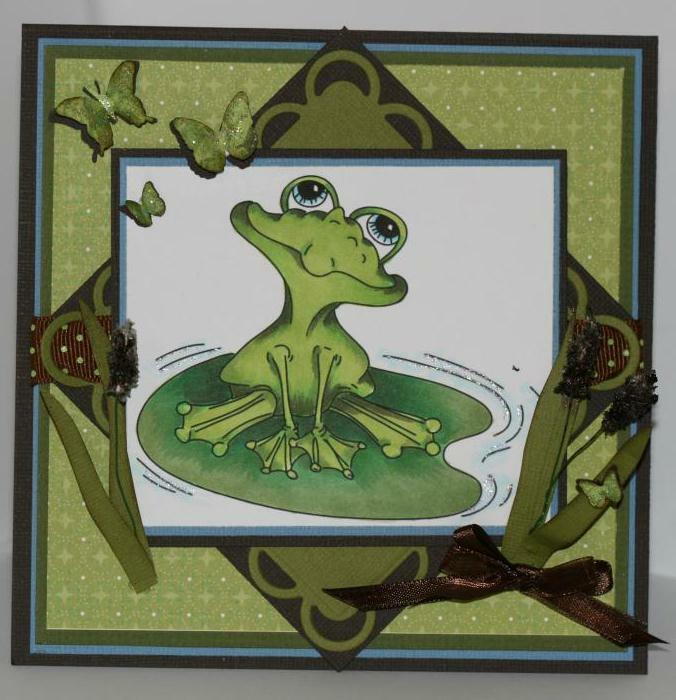 This is my card that I made using the really super cute digital stamp from Whimsy Stamps called Whimsy Frog. A super cute image for a summer card or a birthday card or just because. An up close and personal look at my colored image. I guess I really like green for this card as most of it is green. These cattails took me a little while to make - the picture doesn't really show it that well. Maybe if I describe what I did to make my cattails. I took a piece of floral wire, then rolled a piece of white paper and glued the inside of the rolled piece to the wire. I then used glossy accents all over the rolled paper, then dipped it in white petal soft. After that I then sprayed them with tattered leather glimmer mist. Let them dry, and then glued them to the pieces of leaves that I cut out of green cardstock. Time consuming but relatively easy to make. Supplies:Whimsy Frog digi stamp from Whimsy, Copic markers, Bazzill cardstock, Lacey Squares Spellbinder, Little Yellow Bicycle patterned paper, petal soft, ribbon, Martha Stewart butterfly punches. Love the browns and greens. Too cute! 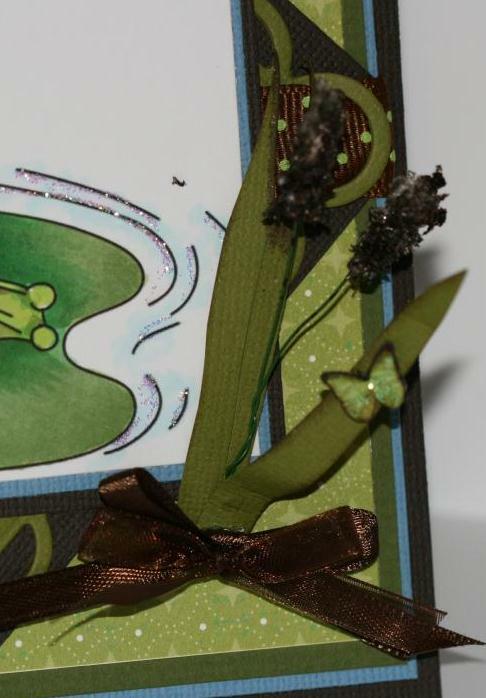 Those cattails are adorable!! This is so pretty! 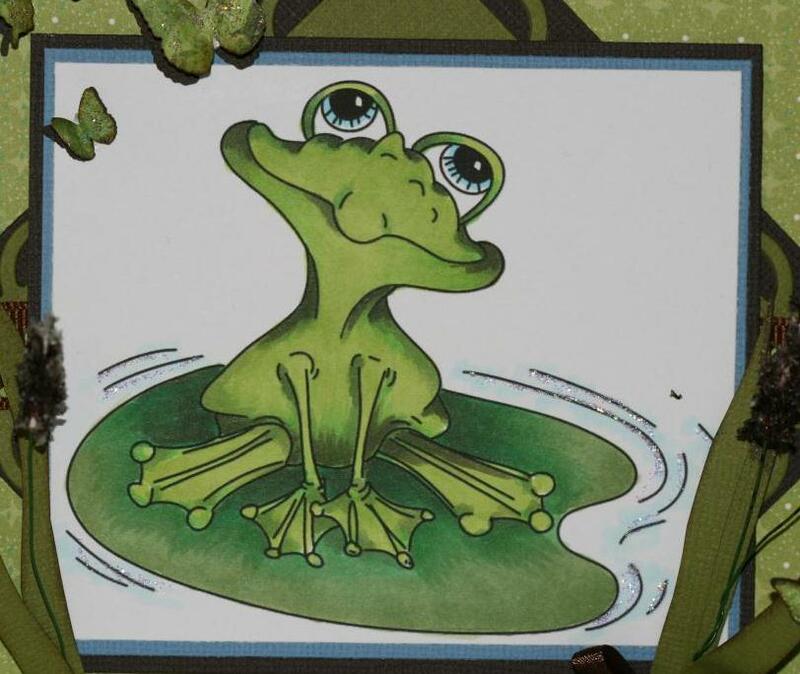 I love that sweet little frog! This is adorable! I love the image, and your embellishments... happy to visit on Whimy's Day 3 Mini Bloghop! Love the ribbon pulled through the die. Love the design! Way to go friend, love the image and the monochromatic green and green isn't my fav as you know. But you smashed this one again....WOWEE!! love it! Love your frog he is so cute! !